Anna: One thing I love about YNAB is that it helped me get out of credit card debt at at a time where I was not in too deep but very well could’ve been soon. Daniela: I’m sort of horrified that I have 11 online subscriptions. But I need them all, I swear! I also YNAB obsessively so those bigger annual ones like my credit card or Amazon aren’t surprises. Angelina: [These vet visits have] been pretty tough. On the other hand, the thing that wasn’t tough was paying for it. I mean obviously it was stressful, but I had the money marked out for emergencies and I could just move it straight to my vet category in YNAB, so it was nice not to be worrying about that too. Melissa: I use YNAB, and I counted my budget categories in prep for this interview — I have 34. I can’t decide if that seems excessive or not. 😄 But YNAB’s idea about giving every dollar a job really resonated with me, so it works. Regular Billfold readers know that I do not currently use YNAB; I run my financial accounts through another popular software program. However, I’ve gotten a little bored with that particular program. It’s good for tracking where your money goes but not as good if you want to track what you’d like to do with your money — and that’s the next stage in my personal financial evolution. I want to start giving my dollars some long-term jobs, and figuring out whether stuff like the two thermal undershirts I bought on Amazon this morning (because my other undershirt had a stain on the armpit and I do not want to wear stained clothes even if no one knows the stain is there but me) will prevent my dollars from doing those jobs. So. Here’s the deal. The Billfold has excitedly and proudly become a YNAB affiliate, and any Billfolders who use this link (it’s also the link at the top of the page) will get two months of YNAB for free. If you’d like to sign up with YNAB now, that means you’ll have two months to figure out how the YNAB system and interface works — I’ve test-driven the app before, and it’s pretty intuitive, but there’s also a learning curve — before you decide whether you want to go full-on YNAB in 2019. I am also going to use November and December to set up my YNAB accounts and get ready for YNAB 2019 — and I’ll be sharing what I learn with The Billfold, so it can be like we’re doing this together. 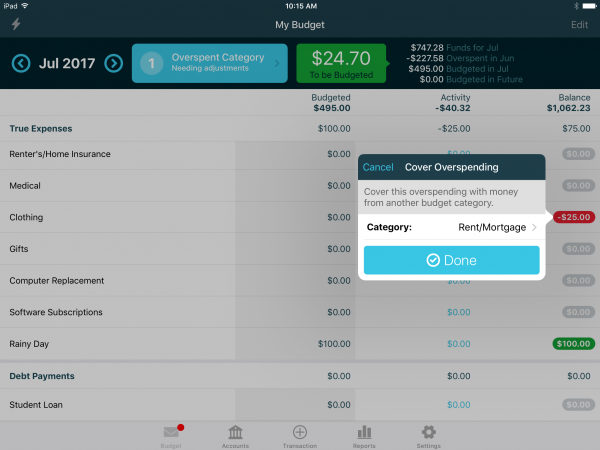 If you are already satisfied with your budgeting app and/or handcrafted spreadsheet, it’s all good. But if you’ve been thinking about trying YNAB and haven’t found a good reason to do it yet, THIS COULD BE YOUR REASON.